Truck Accidents include all types of accidents involving trucks, tractors, trailers and other heavy motor vehicles. 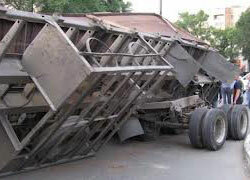 Truck Accidents usually have more serious consequences than Car Accidents due to their larger size and heaviness. Trucks on the highways can lead to accidents involving several cars with higher amount of injured people. a pedestrian, it will unavoidably result in serious injuries. Victims of such a collision could sustain, among other injuries, heavy brain injuries and even pass away as a result of such a collision.